** Thank you for all your food suggestions. It is amazing to see how many of you have had children who struggle similarly when they are hungry. And remember that (*cough* crazy) idea I had about combining your ideas all in one place? Not gonna happen. It would take me weeks, and that would be if I ignored every other responsibility I have in life. But read the comments because there are some fabulous suggestions, recipes, cookbooks, links, etc. **You probably noticed that since the new year I have a few sponsor ads appearing on my sidebar. I don't want to get into the whole "having ads on blogs" discussion, but I want to let you all know that I am slowly moving towards having sponsors that are etsy sellers, small businesses, handmade goods, websites, etc. It is important to me, to share sites and shops with you, that I enjoy or that inspire me. I have a few new sponsors already lined up, but if you have any interest in having a sponsor spot, please send me an email, and I'll offer you the details. To get the ball rolling, I'm offering the spots for half off during the month of March. **Mary has gone on a pants strike. Dresses. All day. All the time. I did manage to get her in pants today because all her dresses were dirty. I told her if she didn't put on pants, she couldn't have lunch with her Pa. It worked like a charm. But, as if I weren't having enough problems finding appropriate clothes from my children already, she's now narrowed my shopping options to dresses-only. Hanna Andersson is having a dress sale right now. Kyrie sent me a link to this site, Basic Brilliance to me which looks great, too. So, I'm back on the hunt for clothes once again. **As of 3:30 this afternoon, our hens have given us 79 eggs. Wow. **I forgot to share the great gifts that Erin and Jennifer gave me during our bloggy weekend. 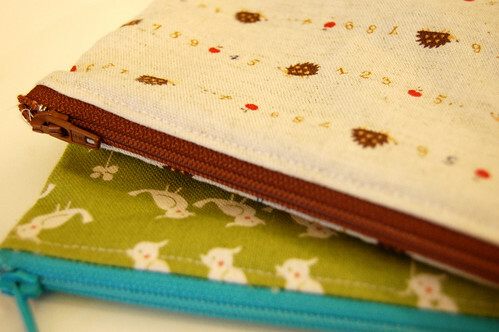 Erin gave the girls these zip pouches with colored pencils (and chubby crayons for Elizabeth) and moleskine journals. I'm seriously jealous. 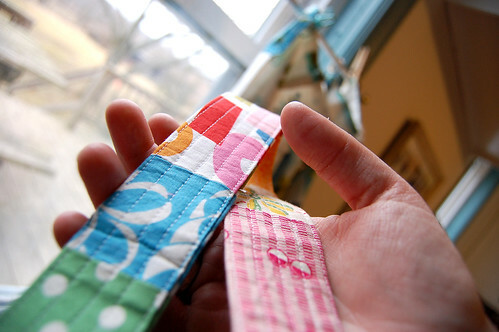 And she gave me one of her fabric camera straps. (Am I lucky or what?) 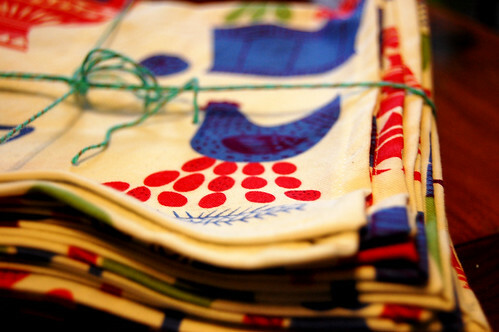 and stitched up a set of these napkins. I think they are pretty much perfect for our chicken-loving family. Thank you, Erin. 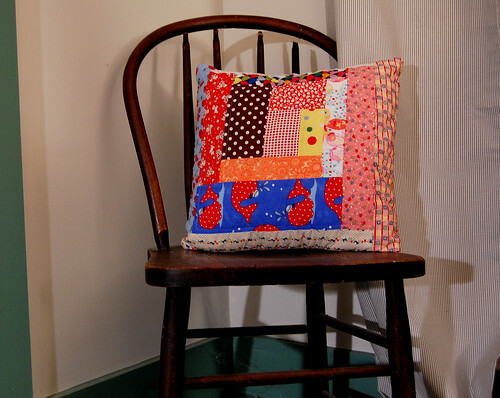 And Jennifer gave me this "crazy" 🙂 quilted pillow–just like the ones I have admired on her blog for quite awhile. It is the perfect squishyness for bedtime reading. Thank you, Jennifer. I love it. And yes, it is still in my room. 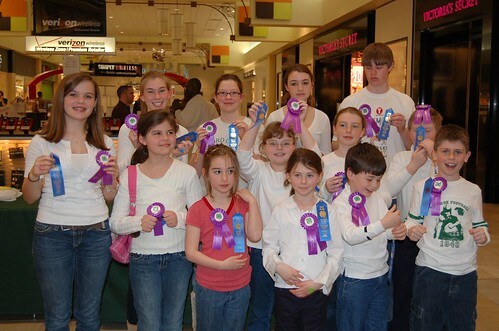 It hasn't been stolen, yet…..
**Over the weekend, Emma's 4-H "Meal Appeal" group gave their demonstration in front of the judges at 4-H Week at the local Mall. 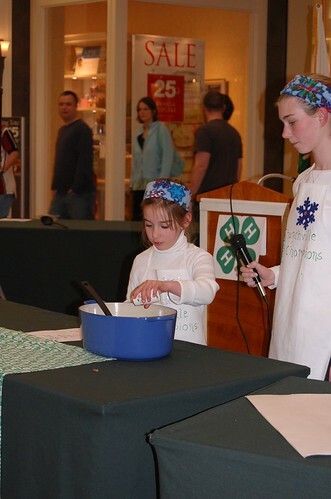 The group of 4-Hers presented a themed recipe and each shared something about the ingredients they were adding. They had a "ski lodge" theme, and made chili. Emma was salt and pepper and she shared some facts about the spices. She also served the judges the chili at the end of the recipe. And guess what? She came home with Grand Champion! She was pretty pleased with herself, to say the least. And proud of that purple rosette. I was pretty proud, too. I adore those tights. And the chicken napkins? So perfect, it’s silly. Lucky girl! I wish I could run around in dresses and tights all day. I’m so tired of my jeans! Such sweet goodness from Erin. It looks like you had a fun weekend! What wonderful gifts you received! What size Hanna does she wear? I have a sz 110 Hanna playdress that I bought at the thrift store (perfect condition) for my niece, but it doesn’t fit her, and I’d be happy to pass it along to you if it would work. Emma did an awesome job! My Maddie was the same about skirts last year. Only skirts. We compromised by having her wear pants under the skirt when we went out. She could always take the pants off when we got to our destination. Aw! 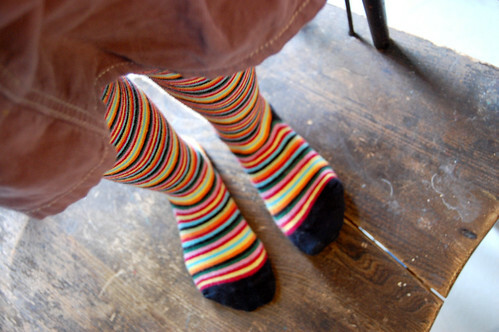 Big congrats Emma!… and dang… if I could work my boy’s legs into rainbow stripey tights, you can bet I would. They are so sweet! Love the fabric camera straps. What a great, cute idea. Sounds like you had a lovely weekend and very full week (so far). I had to laugh at the pants strike. My daughter had a strike of her own once. I had spent quite awhile preparing for the summer one year (she ONLY wore dresses so I bought lots of dresses ahead of time to save $)…then she refused to wear any dress …her best friend was wearing shorts and t-shirts and that’s all she wanted to wear that summer. And all this, when she was almost 4 years old! I can laugh now (she’s 14), but I wasn’t tickled then.